Slender little bluestem seedheads. Wikimedia Commons image by Jose Hernandez. Walsh, Roberta A. 1994. Schizachyrium tenerum. In: Fire Effects Information System, [Online]. to: slender little bluestem. Images were also added. 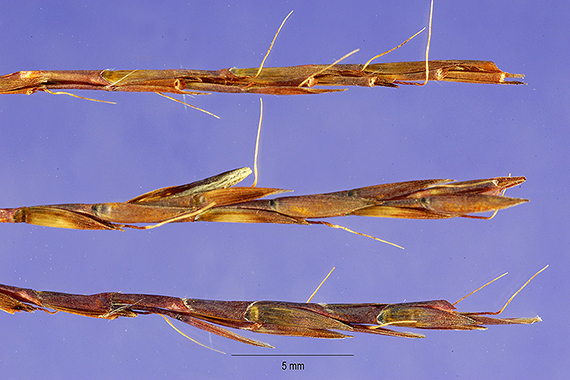 Schizachyrium tenerum Nees (Poaceae) [2,5,13,22]. There are no recognized infrataxa. southeastern Oklahoma and southwestern Arkansas [21,26]. Distribution of slender little bluestem in the conterminous United States and Puerto Rico. Maps courtesy of USDA, NRCS. 2018. The PLANTS Database. National Plant Data Team, Greensboro, NC. [2018, October 23] . Slender little bluestem and pinehill bluestem (Schizachyrium scoparium var. palustris)/bluestem range type in Louisiana and to the west . (Helianthus radula), and Elliott's bluestem (Andropogon elliottii) . pityopsis (Pityopsis graminifolia), and rhynchosia (Rhynchosia spp.). gallberry (Ilex coriacea), and threeawn (Aristida spp.) . lucida), and ground blueberry (Vaccinium myrsinites) . Trinity River floodplain, east Texas, is available . seedstalks form, palatability declines rapidly . on range burned in May remains palatable . grass had been kept short and maturity retarded . acid, but had good lime content . crude fiber and nitrogen-free extract . needs of cattle during the winter . carpetgrass (Axonopus affinis) on patch cuts . the wiry, persistent flower stalks . Slender little bluestem is a native, warm-season, perennial bunchgrass . fertile spikelet is awned. The fruit is a caryopsis . also reproduces by seed [5,21,26]. growth pinelands, pine-hardwood sites, and sandhills . 4.5 to 5.1 at elevations of 197 to 276 feet (60-84 m) [2,29]. depth of 40 inches (100 cm). Elevation is 290 feet (88 m) . nutient-poor quartz sands which are low in minerals and clay nutrients. leaching, and extreme fluctuations of the water table occur . litter, including its own accumulated growth . In the Florida panhandle slender little bluestem blooms from July to October . removes accumulated litter and mulch. Slender little bluestem culms and leaves are killed by fire . as conditions are favorable . than on unburned sites . growth to scattered canopy openings . Productivity of slender little bluestem often increases with burn treatment. slender little bluestem was burned every January or February from 1924 to 1933. Burning increases slender little bluestem nutrient content and palatability. Increases do not last more than a few months after spring burning. for longleaf pine/bluestem range for both cutover and timbered lands. One-third of each area was burned in winter or early spring each year. hardwoods were top-killed, and unpalatable perennials were curtailed. and fall were too low to sustain body weight [9,23]. Florida. Orlando, FL: University of Central Florida Press: 103-149.
project workshop; 1987 May 26-27; Long Beach, MS: Gen. Tech. Rep. SO-68. 13. Gould, F. W. 1967. The grass genus Andropogon in the United States. quality and yield on pine-bluestem range. Journal of Range Management. pine-bluestem range. Journal of Range Management. 26(2): 152-153. 21. Hitchcock, A. S. 1951. Manual of the grasses of the United States. Misc. C. E., eds. Fire and ecosystems. New York: Academic Press: 251-277.
floodplain of the Trinity River, Texas. Contract No. DACW6-74-C-0030. Intermountain Research Station, Fire Sciences Laboratory, Missoula, MT. adequate for cows on pine-bluestem range. Journal of Range Management. 35. U.S. Department of Agriculture, NRCS. 2018. PLANTS Database, [Online]. to increase herbage on grazed and protected longleaf pine ranges.